Most camping etiquette is known as the rules and regulations of camping. You will find them written on the back of the Campground's Brochure along with the map of the area. You will find a Park Host riding around the campground several times a day to make sure these guidelines are being followed. There are consequences to not following them. Be sure to read them as they are different for every campground. Make sure your children know them and follow them. Keep them handy to refresh yourself of the familiarity of the area. The map will help you locate the different areas of the campground. Be alert to all boating signs especially the NO WAKE sign (meaning just drift along). Park your boat in designated areas only. Observe boating safety. Everyone needs to wear a life jacket. Use designated area for cleaning fish. Most campgrounds have fish cleaning stations available. Use caution when casting. You never know who or what is behind you. Ever hear about the biggest tent that got away? 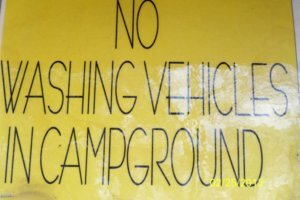 Be sure to follow all campground rules posted for fishing areas. Keep the level of music and televisions down, particularly if windows are open. If you take it outside, set it up where the sound is facing you and not the street or camper next to you. Try not to run your generator at night. If you need to run one for health reasons, place it close to your own camper. Keeping a smaller indoor heater on will cut back on the heater running time down. It will save on using your LP Gas too. Some camper heaters can be noisy. Respect quiet hours – check your brochure of rules and regulations for the park's quiet times. Keep a close watch on your children at all times. They get to running around and don't realize how loud they can get. Teach them how to use volume control when playing. Please make sure your children keep their bicycles and toys out of the street. Put them back at your campsite when they are finished playing with them. 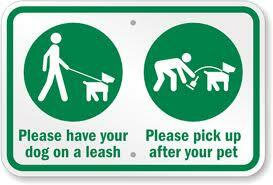 Please keep your pets on a leash when you bring them outside. Some people are afraid of dogs and their barking. Pet dander can affect those with allergies, too. Scoop the poop of your pet's daily doodies. Please take them away from other campsites and keep them leashed to prevent accidents on tires. Try to use dry wood which keeps smoke to a minimal. Using "green wood" creates lots of smoke. Make sure you don't have a roaring fire out at night before going to bed. Close the grate if you have some embers still burning. Pick up only limbs and logs which are already on the ground. Don't cut down any trees for firewood. That is against most park regulations. Keep your campfire contained in the fire ring. Do not burn wood anywhere there is not a proper location designated for campfires. Watch children carefully when around the campfire. They can get too close and get burned very easily. Be sure you park your vehicle out of the street. Some roads are not very wide and campers need space to go through and have room to back into a camp pad. Park in designated areas only. Don't park on the side of the road if it is not a parking area. Utilize the boat parking lot for your boat. Please don't park on the grass. Always walk on the paths designated for walking and riding your bike. Please don't walk through another person's campsite. Tell your children to be cautious when playing. They like to race and shortcuts through other campsites may pose a problem with some campers. Don't "borrow" your neighbors furniture or firewood without permission. Don't abuse the tables provided by the Campground. If you are missing a table, ask you Park Attendant to get you one. The playground equipment is there for your use. Please don't allow your children to alter it or misuse it. Clean up your site before leaving. Make sure all trash is picked up and disposed of properly. Do your part to keep the restrooms clean. Be sure to flush. If it needs attention, contact the Park Host. Please keep an eye on a washer load or dryer load of clothing you have put in. Get your laundry done in a timely manner. Please don't throw garbage in the water. Use your trash bags. Waste water should not be dumped in a lake or on the ground. Use the dumping station for proper disposal of waste. Keep your picnic table free of food if you are not using it. You will have some raccoon and opossum company if you leave it out. Most campgrounds have a speed limit of 10 mph. Please obey it. Washing your camper or vehicle at the campground is a no-no. You could be asked to leave the campground. Report any activity that is not family friendly. Respect other people's rights to a fun, quiet time at the campground. Please keep your children from "cutting through" another campsite. Teach them to walk around. Follow all rules yourself as an example for others. Clean up your campsite cleaner than when you arrived. Rules are given to us for our own protection as well as the protection and safety for everyone. Most of them are just common sense, but it doesn't hurt to remind ourselves that there are certain things we can and can't do. Our children and visitors need to follow them also. You run the risk of being asked to leave if you do not follow them. Every campground has rules and regulations, but they do vary from one to another. You can get a list at the Park Host gate. The ones we listed here are on the brochure plus we have added some that we have learned over the years of camping we have done. If you follow them, your stay will be more enjoyable and safe.